The prospect positional rankings series is complete! The schedule (located at the bottom) contains links to each article in the series. Since the rankings process began in November, fall/winter league performance and further research have forced reassessment of grades. As such, the following prospects experienced notable grade changes, positive and negative, significantly impacting positional ranking. The prospect rankings schedule and a guide to fantasy tool grades can be found here. In addition, to see where the prospects below now fall in the overall rankings, you can obtain access to the updated Top 600 Dynasty League Players with a small donation. 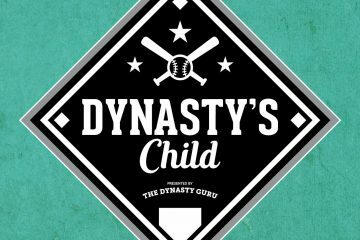 A minimum donation of $10 grants you access to a downloadable spreadsheet of TDG’s 2019 Dynasty Baseball Rankings! Once your donation successfully processes, you will receive an email with a link to the rankings. Arguably, Peter Alonso is the premier power bat in minors. With plus bat speed and 80-grade raw power, he generates unique, majestic blasts, such as the one below. Further, Alonso has a mature, patient approach at the plate with very reasonable swing-and-miss (9.5% swinging strikes), allowing projection on his hit tool to average (or even above). 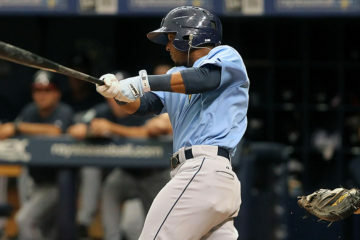 Most importantly, he likely will assume the starting first base job for the Mets by mid-April. As such, risk associated with a 24-year-old R/R first base prospect is less than normal. Alonso is a top-10 dynasty option at first base and a top-15 fantasy prospect. A reported swing change presumably contributed to Evan White’s explosive final 27 games (.379/.467/.689). In addition, observers report significant pull-side power and big exit velocities. Meanwhile, although he is a plus runner underway, he is slow to accelerate, and, likely as a result, finds little success stealing bases (23-for-33 in 297 total games between college and the minors). White possesses untapped fantasy potential, with the ability to provide rare, five-category value at first base. Should his swing change continue to pay dividends, he is a potential riser in 2019. It may be his fun-loving attitude. It may be his most recent epic performance in the Venezuela Winter League (.325/.370/.500 with 10 home runs and 4-to-13 strikeout-to-walk ratio) including the below home run. 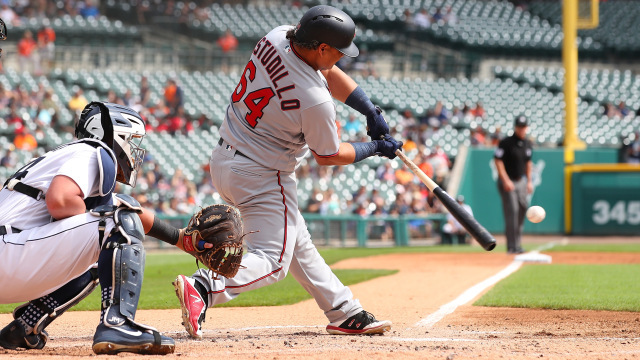 With all that said, Astudillo still faces an uphill battle for playing time, competing with Jason Castro and Mitch Garver behind the plate. There remains substantial risk the novelty of his contact-heavy approach wears off fast. 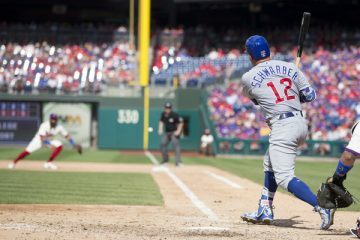 Nevertheless, the catcher landscape is barren, and he provides enough upside to target as a borderline, top-20 dynasty catcher and a top-10 catcher in redraft leagues. A pun, courtesy of Jordan Rosenblum: what type of apartment does Willians live in? Alex Reyes should carve out a sizable role for the Cardinals this year. Unfortunately, it is unclear what role that will be. His value will take a hit if the Cardinals relegate him to a non-closing, late-inning role. With a wealth of options for the rotation and, now, the bullpen (signing of Andrew Miller), Reyes enters the year (and the foreseeable future) with too much uncertainty. In fantasy, fielding is only relevant to the extent it facilitates or hinders opportunity and eligibility. In the case of Michael Chavis, it is highly relevant. Simply put, he is a poor defender. Few observers believe he will be anything more than a borderline-average defender at third base. Given his size (5’10”), he also lacks the length to play first base. A prospect without a position is problematic. In the short-term, Chavis likely has no place on the competitive Red Sox active roster. Last Monday, Kyler Murray declared for the NFL Draft. His decision has devolved into a battle of the major sports. In fact, he has been working out with superstar Antonio Brown (below). Will Murray choose football or baseball? The better question as a fantasy owner, however, is, do you want to draft him in a FYPD to find out? Next up, the 2019 Top 500 Fantasy Prospects. Stay tuned!